(Nanowerk News) A cobalt-based thin film serves double duty as a new catalyst that produces both hydrogen and oxygen from water to feed fuel cells, according to scientists at Rice University. The inexpensive, highly porous material invented by the Rice lab of chemist James Tour may have advantages as a catalyst for the production of hydrogen via water electrolysis. A single film far thinner than a hair can be used as both the anode and cathode in an electrolysis device. The researchers led by Rice postdoctoral researcher Yang Yang reported their discovery today in Advanced Materials ("Porous Cobalt-Based Thin Film as a Bifunctional Catalyst for Hydrogen Generation and Oxygen Generation"). They determined their cobalt film is much better at producing hydrogen than most state-of-the-art materials and is competitive with (and much cheaper than) commercial platinum catalysts. They reported the catalyst also produced an oxygen evolution reaction comparable to current materials. "It is amazing that in water-splitting, the same material can make both hydrogen and oxygen," Tour said. "Usually materials make one or the other, but not both." The researchers suggested applying alternating current from wind or solar energy sources to cobalt-based electrolysis could be an environmentally friendly source of hydrogen and oxygen. "Here we can just alternate the current from positive to negative and back again, and hydrogen and oxygen are made with the same material," Tour said. "And the material itself is very easy to make." He said manufacturing the film is inexpensive and scalable. 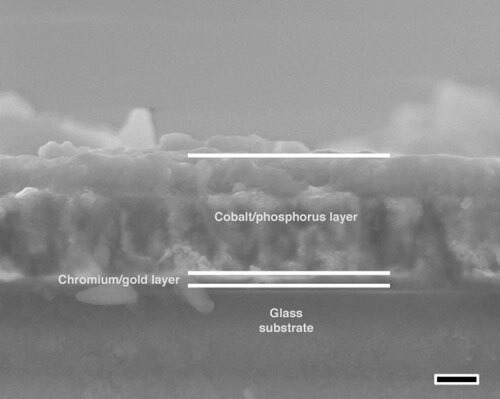 The lab fabricated the 500-nanometer films by anodyzing a cobalt film electrodeposited on a substrate. The assembly was then baked for two hours in a phosphorus vapor that converted it to a cobalt/phosphide/phosphate thin film without damaging its porous structure. The material proved to be robust in both durability tests and in acidic and alkaline conditions, Tour said.